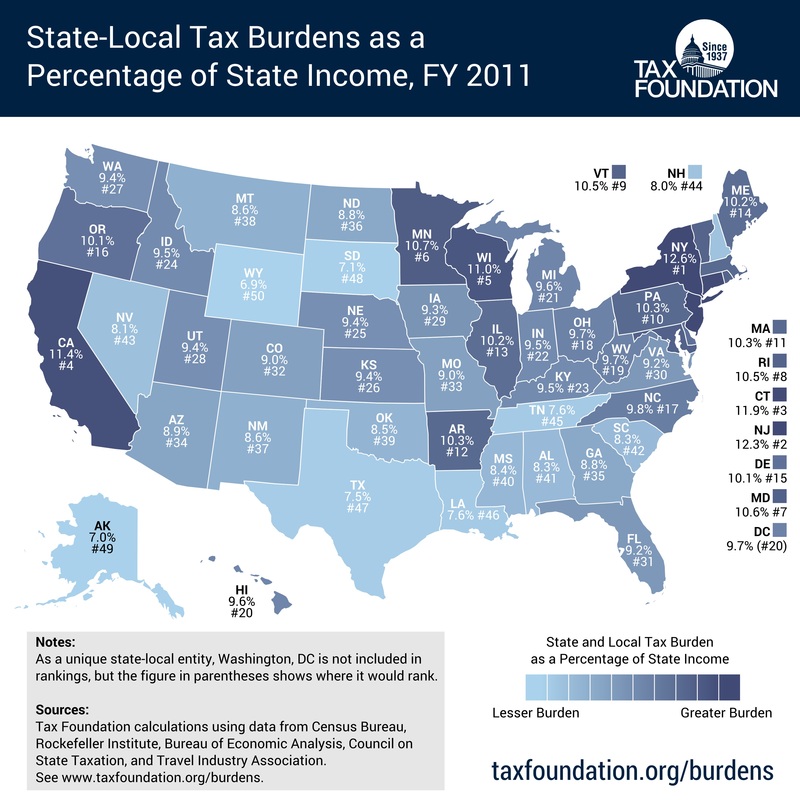 You can tell a few additional things just by looking at the map, most notably that the high-tax states are largely along the Pacific coast, in the upper Midwest, and much of the Northeast. The rest of the nation seems more reasonable. 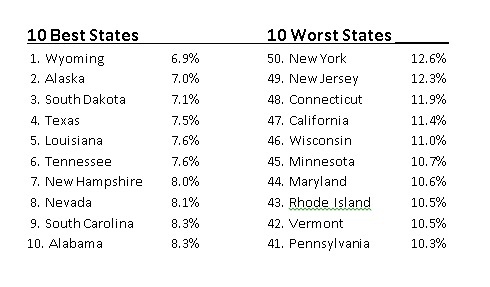 If you specifically want to know the best and worst states, I’ve put together a list. But I’ve reversed the order. The state with the lowest tax burden is #1 while the state with the greediest politicians is #50. A couple of observations on the data. First, it helps to have no state income tax. The top four states, and seven out of the top 10, avoid that punitive levy. Second, while it’s no surprise to see which states are at the bottom because of harsh tax burdens, it will be interesting to see how Chris Christie and Scott Walker explain the poor rankings of their respective states should they run for President. This isn’t to say it’s their fault. After all, New Jersey and Wisconsin were high-tax states when they took office. But it will be incumbent upon them to say what they’ve done to make a bad situation better (or at least to keep a bad situation from getting worse). Here are some more interesting maps, including international comparisons, national comparisons, and even one local comparison. Another silly map showing that America is supposedly one of the world’s most authoritarian nations. In which state is the burden of government spending climbing most rapidly. P.S. I wrote recently about the foolishness of anti-money laundering laws, which impose very high costs without having any positive impact in terms of thwarting crime. Now bureaucrats want to make these laws even worse. Casinos are going to be required to be more intrusive, regardless of whether there’s any evidence or suspicion that customers have done anything wrong. I’m not a gambler, so I don’t worry about the fate of Las Vegas, but even I feel sorry for the casinos since many high rollers from overseas will decide to go to Macau, Monaco, or other locations where they’re not treated poorly because of misguided government. Interesting map… The first thing that I noticed was that ALL ten of the best states are red states (Republican) and ALL ten of the worst states are blue states (Democrat). Interesting that the state I live in, Utah, has a middle-of-the-road tax burden. We also have a booming economy with low unemployment (even counting our many seasonal and part-time workers as unemployed), a AAA credit rating, rapid population growth, and decades of budget surpluses. We do have an income tax, but it is flat with a surtax for high-income taxpayers. Interesting note: I was born and lived my first 11 years in one of the worst states on that map (California) and lived another 16 years in one of the best (Texas). North Carolina should be rated higher (that is, worse). It has a lot of local add-ons and sneaky ways of biting into income. I actually fared much better in Pennsylvania.